Small towns like Westville dotted the 1850's countryside. Westville was created so we could enjoy, in the 21st century, towns similar to ones our ancestors lived in in the middle of the 19th century. 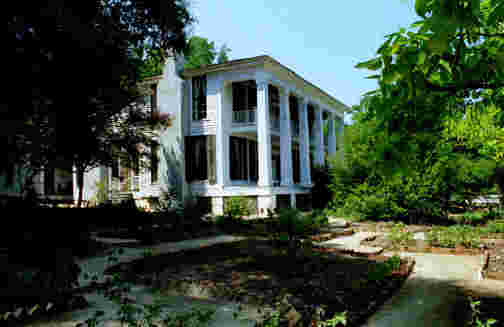 Westville has over 30 authentically furnished pre-Civil War buildings. Let's watch the wet clay rise to a pitcher in the potter's hands as he turns his wheel. 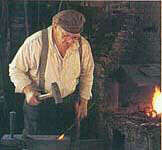 Or, we can watch the sparks fly from the blacksmith's anvil as he fashions horse shoes and other objects needed in the town. 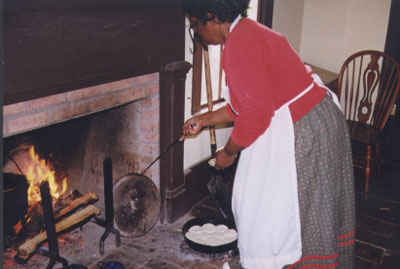 If anyone is hungry, we can sample the hearth-cooked food while we listen to the "townspeople" talk about life in the old days. 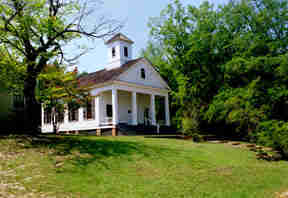 Let's step inside this old church and sit on the handhewn pews. 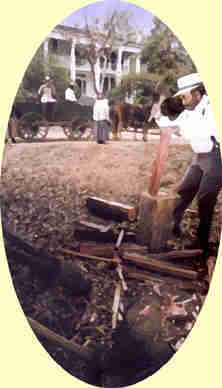 The timbers in the log cabin and other buildings still show the hewing marks of the builder's broadax as he squared the logs. Back in the 1850's, each family had to grow their own food. In Westville, the crops are raised just as they were back then. 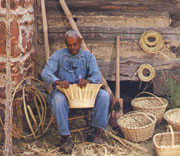 In the mid 19th century, baskets had many uses. Small, round ones were used for gathering eggs; flat ones for carrying clothes; and large, round ones for holding cotton. 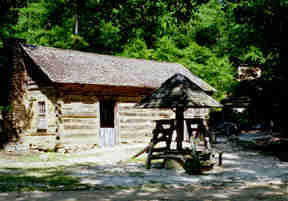 The baskets were usually made of split oak. Often, the basic wood used in furniture was pine with a thin mahogany veneer glued to surfaces. Wealthier citizens had their furniture made in Charleston or Savannah and shipped to their home. Candles were made of beeswax or tallow. Hot wax is poured into a mold which has a string (wick) pulled through it. Here is an interesting fact: candles had to be made in cold weather since the wax would not harden during warm weather. Quilting was popular among the girls and ladies of 1850. Girls usually learned to quilt by the time they were 8 or 9 years old. Cotton cloth is made in Westville just as it was in 1850. Right now, we have a bit of traveling to do. Everyone pile in the Chevy. let's kick it in gear, and we're off.